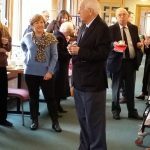 Dr. Brian Gegg (85), the well-known and respected optometrist in Hart Street, Henley-on-Thames for many years, was today celebrated and thanked by Christ Church for his faithfulness in playing the organ in services since 1966. Brian first started his music career as a child in Cirencester when he learnt to play the piano from his Aunt who was a music teacher. During World War 2, an organ player from London, who was also an organ builder, was posted to Cirencester as a civilian surveyor attached to the Army Department. At that time, the local Congregational Church had a pipe organ that worked with hand-blown bellows to supply wind, being pumped by boy scouts. The organ builder agreed to teach Brian how to play if he helped to build an electric blower. Continuing piano and music exams he also started organ lessons, and at the age of 15, played the organ for his younger sister’s christening. 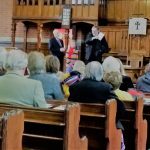 He moved to Reading in 1949, transferring to Reading School where his organ tutor arranged for him to be an assistant organist at St. Andrews Church, Sonning. Here he met his future wife Rosemary, who was a Sunday School teacher. 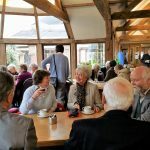 Brian has been involved in playing in churches in and around Sonning, Reading, Bristol, Cirencester and Henley-on-Thames for over 70 years. 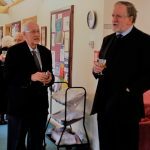 He has fond memories of accompanying services during this time, and also playing for radio broadcasts on BBC Oxford, BBC Gloucester and, in 1976, for a BBCtv Songs of Praise from Henley. 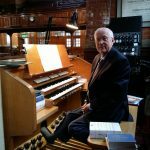 He retired from his optometry practice and as a visiting lecturer at City University and also the Royal Berkshire Hospital Eye Department in 1996, but continues his interest in organ playing. Click below for a short clip of Brian playing in Christ Church.